Google business pages for accommodation owners, claim yours today. 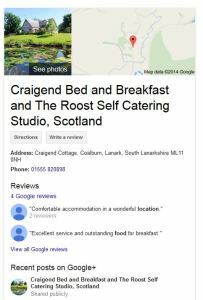 A Google business page is a big free internet opportunity for independent accommodation businesses and it’s probably the most important one. Why? Google uses the information for Google searches and on Google maps. Millions of customers use Google maps everyday and tens of billions of accommodation searches take place on Google every month. It’s big, it’s free and it gets you seen and it also improves your listing on Google searches. In a related blog we show you how to get your Google business page. Someone else might register a Google business page in your name. You want to claim what’s yours so get ahead and register it for yourself so you have control over your business page. Google maps is massive on mobiles and at the top of searches. Millions have downloaded their map app so why not get yourself on the map and catch more potential customers. The vast majority of accommodation businesses will have websites but if you don’t, then a Google business page is even more important. It’s not just your address and contact details. You can make your page beautiful and ensure you stand out and shine, displaying your best features. Upload your best photos, descriptions and video. Google will make it all look great with their page layout and enhanced street view. in the mobile Google map app, next to your neighbours…. who might be ahead of you! It’s a fact, your search engine ranking is improved when you have a Google business page making it easier for customers to find and book you. Your Google business page helps your search engine ranking for various local and generic searches. Get a Google plus account and use it on your business page to share news and engage with customers, tell the world about what you are up to and manage your reputation. 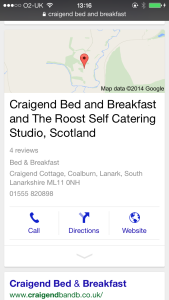 It’s expected that Google will soon launch new ways for customers to access accommodation businesses and do bookings. Your business page will be the keystone of your visibility for booking capability in future. It’s easy and quick – so make yourself accessible now, it’s also Mobile, Social and Local…. and yes, it’s FREE! I would like to get my Google business page show me how. Don’t forget to add yourself to our Google+ account, our facebook page, twitter or register for our emails. Posted in Google Business page, Google Hotel Finder, marketing, mobile, online, technology, tips, websiteTagged accommodation, accommodation on google, bed and breakfast, campsites, cottages, Google business pages, Google Hotel Finder, google search, hotels12 Comments on Google business page – why NOW ?